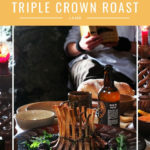 In this epic Feast for Kings, we host a Game of Thrones-inspired banquet with a show-stopping triple crown roast of lamb and all the trimmings. This post has been created in collaboration with Try Lamb. I confess, like many others, I am a huge fan of the Game of Thrones series. Truth be told though, I watched the first series on tv and then found out they were based on the books, so I switched over to reading the original Song of Ice and Fire series. I couldn’t wait for the next tv series to find out what happened! Although I did become frustrated at how the tv series had deviated from what was written in the books, I’ve remained a huge fan over the years. The tv show appears to be coming to an end sooner than the books are (hurry up and publish The Winds of Winter, will you! 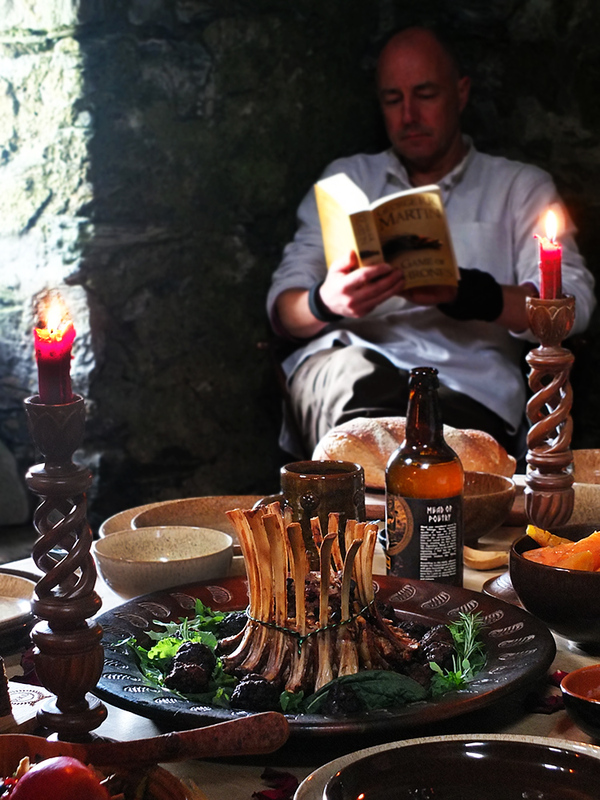 ), but still, to celebrate the very last tv series I thought I would host a Game of Thrones inspired feast in one of my favourite venues. Plus, it was an opportunity to wear my steampunk corset that I made all those years ago. The star of the show: a triple crown roast of lamb with lamb & chestnut stuffing and all the trimmings. 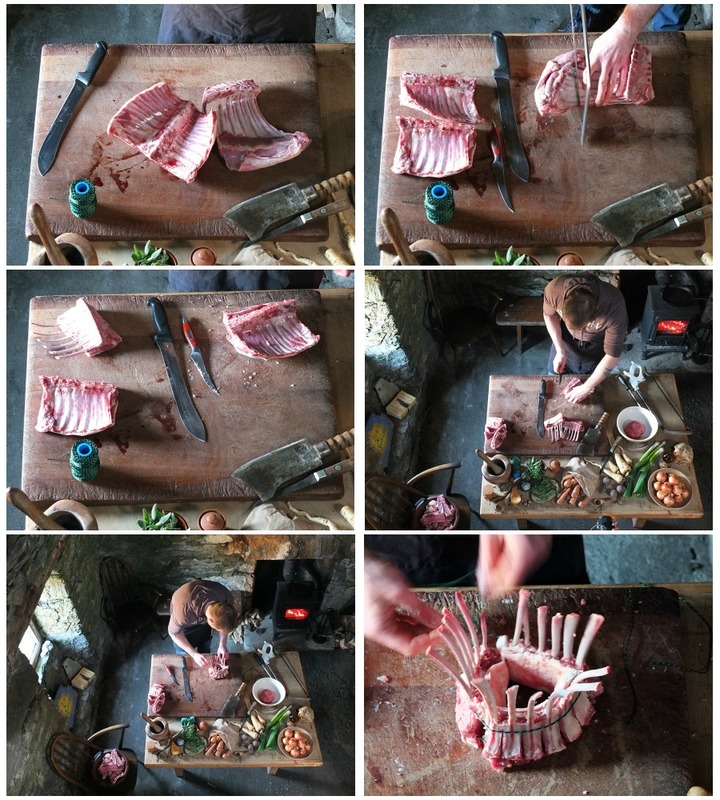 As any good banquet should have, we had our own in-house butcher (@reelmaetshetland on Instagram) who showed us how to butcher and French-trim the three lamb racks needed for our triple crown roast of lamb. We also had our own filmmaker, so do watch our film below (if it’s not already auto playing in a sticky video in your sidebar!). Score the membrane at the base of the chop so that the racks can curve easily. Take care not to cut all the way through. Score the base of each rack just where the bone begins, taking care not to cut too deeply. Curve the racks, rib side out, to make a circular crown shape. Tie one length of butcher’s twine around the base of the crown, inserting it where you’ve scored the base of each rack. Tie another length of butcher’s twine just below where the meat begins. 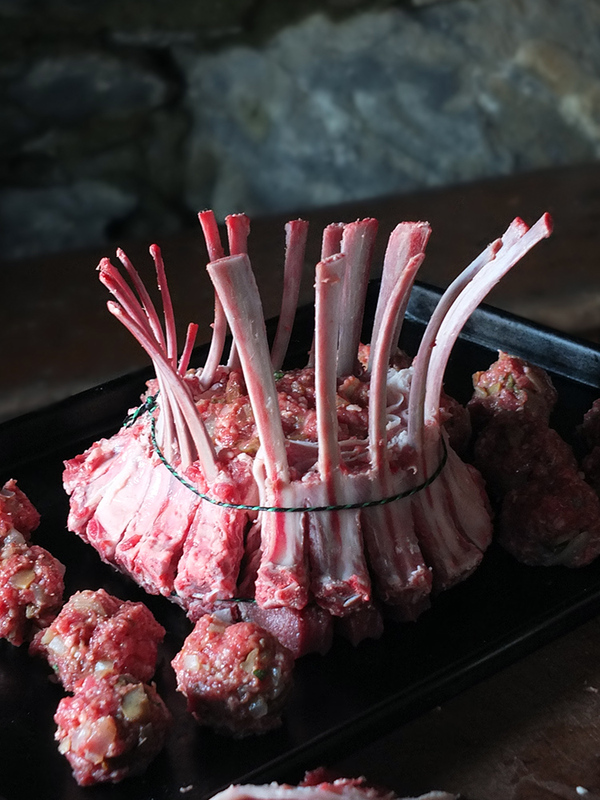 A triple crown roast of lamb makes for an incredible centrepiece for a Game of Thrones-inspired feast, I think. Its protruding bones are very reminiscent of the Iron Throne. Although it seems to be complicated to make, you’ll be surprised at how easy it is. It also cooks incredibly quickly, for something so impressive. If you don’t stuff it, it’ll take only 30 minutes or so to roast. I’d recommend roasting it on its own, with the stuffing balls separate. You could then use the empty space in the middle as a ‘bowl’ to serve the stuffing, or any other filling you wish. How about some jewelled couscous, or your favourite lamb accompaniment? My stuffing features lamb sausage meat, made especially by my butcher for this event. I’ve seasoned it simply with sauteed onions and roasted chestnuts, with a handful of fresh herbs and a generous spoonful of powder deuce, a mediaeval spice blend. I’ve also added a generous glug of locally brewed (very, very north of the wall!) honey mead, as it just seemed appropriate, somehow. Mix together all the ingredients and store in an airtight container until needed. 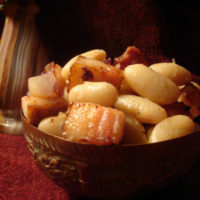 I used some of this spice blend to season one of the side dishes too: white beans with bacon. Saute onions in butter (or lamb fat) until softened; cool slightly. 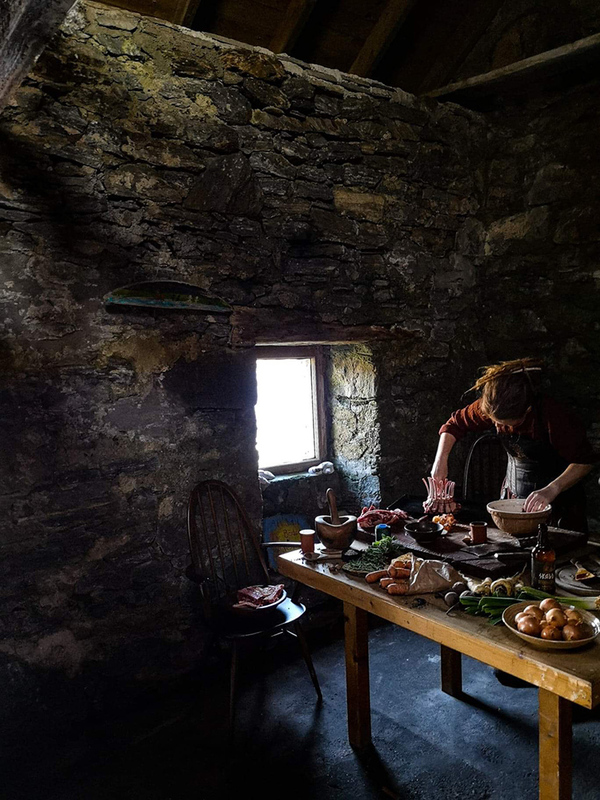 Place sausage meat in a large bowl and add the chopped chestnuts, egg, fresh herbs, a spoonful of powder deuce and a glug of mead. Mix well with your hands and loosely stuff some into the hole in the centre of the triple crown roast of lamb. Form the remaining stuffing into stuffing balls and arrange on a baking tray around the triple crown roast of lamb. Cover the bones of the triple crown roast of lamb and the top of the stuffing with aluminium foil and roast in a preheated oven for 45-60 minutes. Remove the foil for the final 5 minutes of cooking. Transfer the lamb to a serving tray and cover in more aluminium foil and some tea towels to keep warm for 10-15 minutes while you set out the rest of the table. 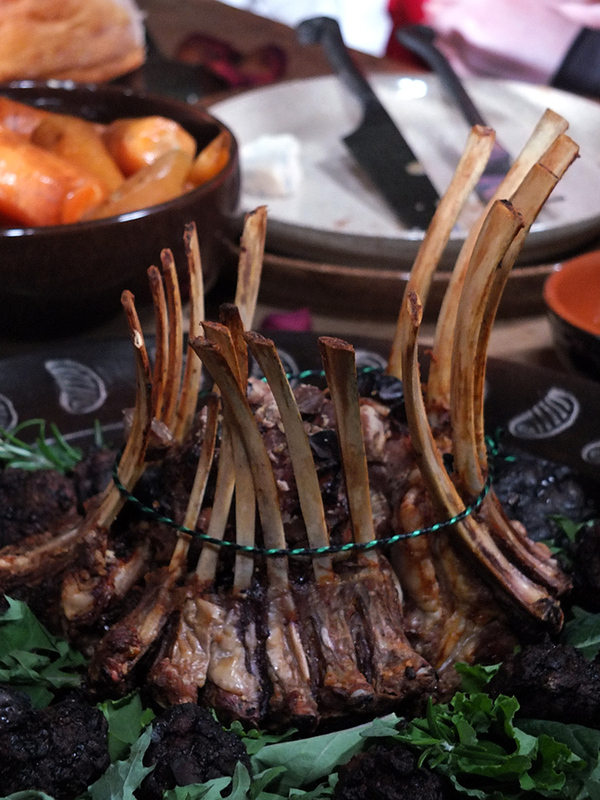 Perfect for a Game of Thrones inspired feast, in this short film we show you how to make and stuff a triple crown roast of lamb. 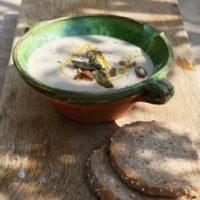 Our feast began with a starter of creamy chestnut soup, crusty hot bread and greens dressed with apples and pine nuts. This was followed by the main course of the triple crown roast of lamb, the lamb sausage meat and chestnut stuffing, white beans with bacon (and some locally grown kale) and some buttered carrots, scrubbed clean of their dirt in the sea before coarsely chopping and boiling until tender. There was more bread, too, served with olive oil to dip. 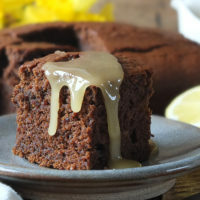 Dessert was Elizabethan-style honeycakes flavoured with caraway, baked with a honey glaze and homemade gingerbread – a recipe I’ve been making since I was twelve. To drink: honey mead, crafted in small batches in a remote location incredibly north of the wall. A huge thank you to my dinner guests, Mike, Ashlea and Chris for making this experience as incredible as it was. 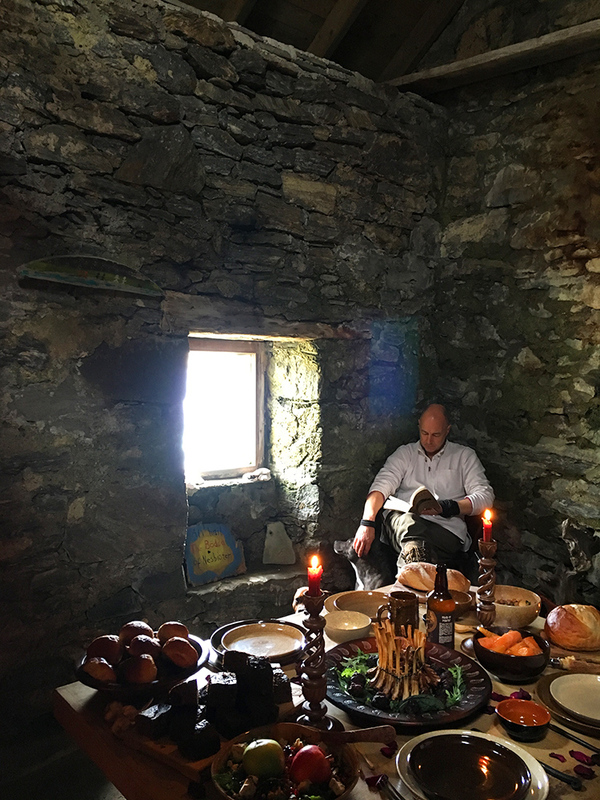 Thank you too, to Keiba Film, for braving the cold April weather to accommodate my wish to host a feast in an old stone fisherman’s hut with no electricity. Didn’t she do a fantastic job with the video! 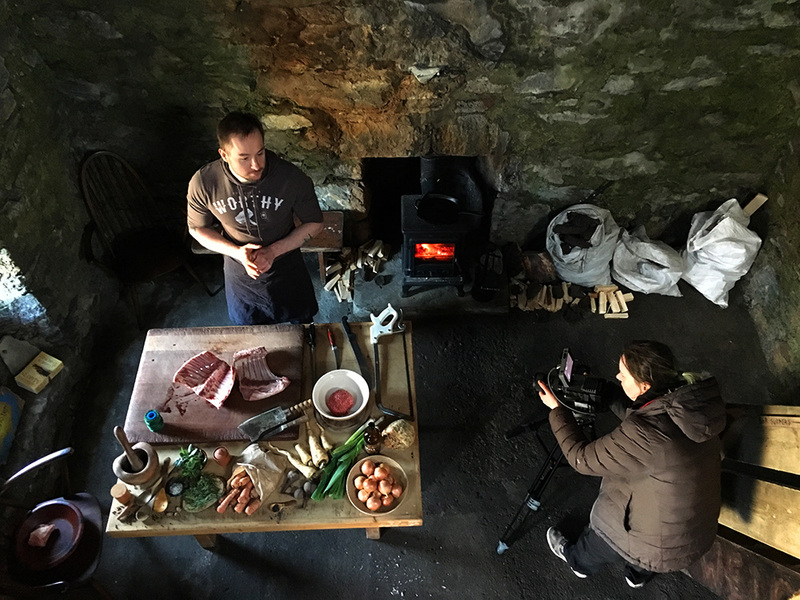 Thanks also to Anderson Butchers for all their help and the Shetland Amenity Trust for permission to film in Nesbister Bod. Also, a huge thank you to Try Lamb for sponsoring this epic feast and making a dream become a reality. Lamb, Try It, Love It was created to help banish the bland and help make meals great again. This campaign was started to prove that lamb is so much more than a roast dinner with mint sauce. Lamb is an incredibly versatile ingredient available in a wide variety of cuts which can be prepared into a wide range of dishes, any time of day. 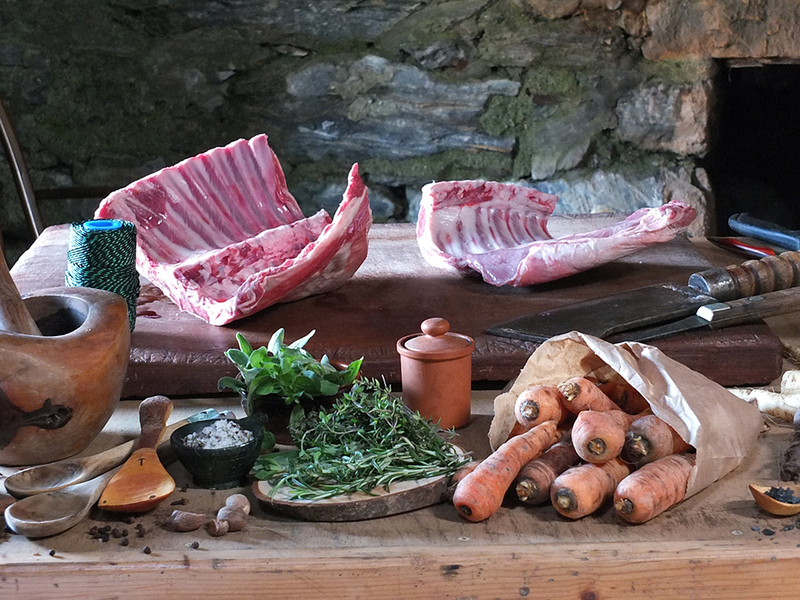 Visit the Try Lamb website for more recipe inspiration, and have a look at our lamb archives. Don’t forget to follow Try Lamb on Instagram and Facebook. Will you be tuning into the last series of Game of Thrones? 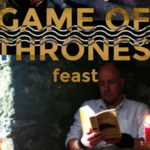 Will you be celebrating with a feast (preferably not the Red Wedding kind!)? 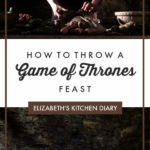 Let me know what you would serve at your epic Game of Thrones feast in the comments below! In this Feast for Kings, we host a Game of Thrones-inspired banquet with a triple crown roast of lamb filled with sausage & chestnut stuffing. Ask your butcher to French-trim three 6-rib lamb racks. Then, score the base of each rack just where the bone begins, taking care not to cut too deeply. Curve the racks, rib side out, to make a circular crown shape. You could use a tin can covered in foil as a base to curve the lamb around to make things easier, if you wish, removing it before roasting. Tie one length of butcher’s twine around the base of the crown, where you’ve scored the base of each rack. 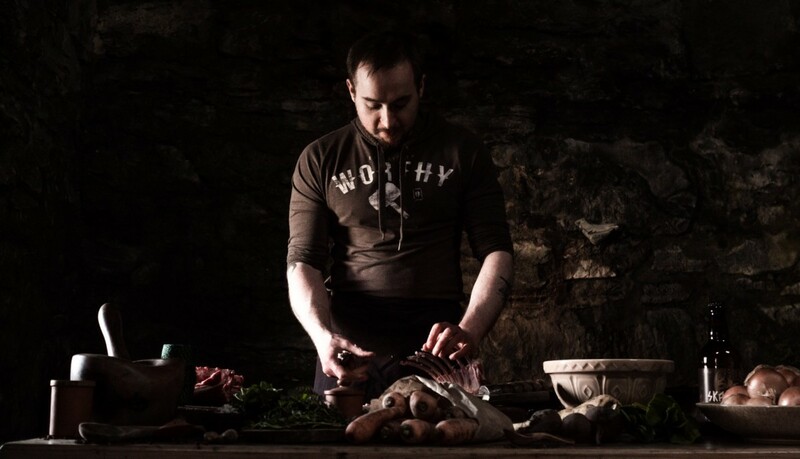 Place sausagemeat in a large bowl and add the chopped chestnuts, egg, fresh herbs, a spoonful of powder deuce and a glug of mead. Mix well with your hands and stuff some into the hole in the centre of the triple crown roast of lamb. Form the remaining stuffing into stuffing balls and arrange on a baking tray around the triple crown roast of lamb. Alternatively, to reduce cooking time, you could roast the stuffing balls separate and serve them in the lamb crown like a bowl. Cover the bones of the triple crown roast of lamb with aluminium foil and roast in a preheated 200C/400F/gas 6 oven for 45-60 minutes. Mix together all the ingredients and store in an airtight container. These were some of the other dishes served at this epic meal. This is a rich and elegant soup with a beguilingly velvety texture. I served this in one large dish instead of individual bowls. I cooked the onion in lamb fat and added a handful of locally grown kale too, for colour. Adapted to include caraway seeds, and I glazed them with honey before and after baking instead of filling them with honey. Served cold for this feast, without the lemon sauce. This is a sponsored post in collaboration with Try Lamb, although all thoughts and opinions expressed are our own. Thank you for supporting the brands who make it possible for me to do what I love: mess up my kitchen and share recipe stories. This look so good and loving the game of thrones theme. Thanks for sharing. These photos look like it need to be published in a cookbook! What a fantastic centrepiece. 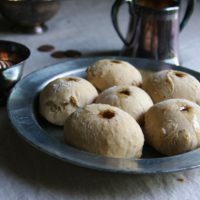 My husband is a huge GoT fan and would love to eat this whilst watching! Wow! What an amazing dinner! You guys did a spectacular job. wow! it looks fantastic, definitely a lux dish. I would so eat it all even though it does look very filling! Wow, this is quite the recipe!!! Thanks for sharing it! Sometimes I feel like the only person out there who has never seen Game of Thorns. But I don’t need to have seen it to know that I want to try this lamb – and even better is the stuffing. 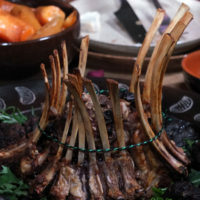 Although I am included in the small percentage of people who has no idea about GOT episodes, I totally like this Roast of Lamb recipe and it looks really flavorful and appetizing! What a fantastic display and feast! This is such a fun post…GoT is so good! I’m so excited about this season! I loved how rustic and game of thrones it all looked. 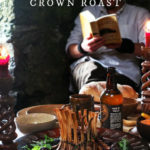 I now need to try this recipe, just for the crown effect lol. 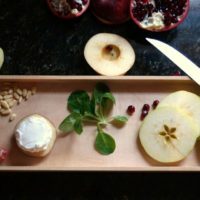 Loved this and will give this recipe a try soon! Thanks! not a GOT fan. but the lamb looks good! This lamb looks like it would be absolutely amazing. I definitely need to give this a try. Love this Elizabeth. What a brilliant setting and such a fun thing to do. Your dinner is so in keeping with it all too. As long as it didn’t turn into the Red Wedding – eek! Its at that point my mum stopped watching. I have to confess to never reading the books, but have loved the tv series. We don’t have netflix, so will have to wait until the CD comes out. OMG Kudos to this creative thought! It looks super delicious, total yummmyyyy Not a fan of GoT but absolutely loved your idea ☺ Amazing photos. What a beautiful idea, which is certainly very good, but which also has an effect that definitely amazes guests! It’s Spring here in Scotland this week, and our locally grown veg box has plenty of leafy greens – salad, kale, spinach, chard. 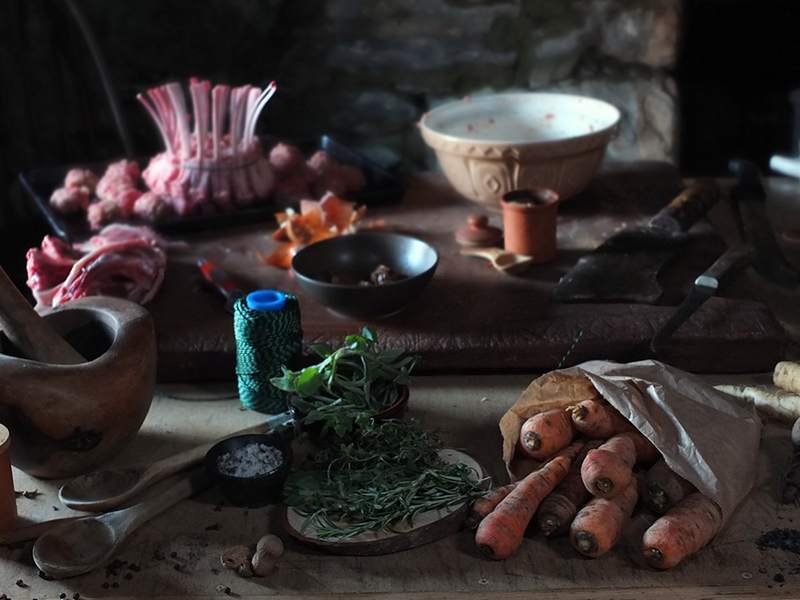 There’s still last winter’s carrots, celeriac and beetroot too. As for a treat – we bought our first Scottish strawberries yesterday; deliciously ripe and juicy! This looks absolutely insanely awesome. What an experience. 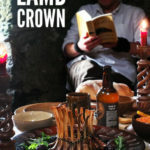 Oh wow this sounds like such a delicious feast and that lamb crown is such a showstopper, I bet it tasted absolutely amazing! I also love the sound of the honeycakes for dessert! Oh this is brilliant. I LOVE GoT and am so excited about the new series. A brilliant time to release such an apt recipe! How fantastic to such a great place to hold a magnificent banquet!! Love the spice rub. These are exquisite pictures. I wish I watched the show so I could appreciate it even more. I love lamb and this entire dinner is amazing. I haven’t watched the show but I’m definitely loving this lamb recipe! what a great dish for entertaining. How creative!!! I love GOT, and this is a super cool way to celebrate the theme. Thanks 🙂 I hope your friends enjoy it as much as we did making it!